BTSKY Cute Pencil Case - Large Floral Pencil Pouch Makeup Bag is currently selling at $9.99, which is its normal price. It has a lowest price of $9.99 and is selling within its usual range. Price volatility is 0.15% (meaning it does not change often), so you might have to wait a while for the price to drop. Until then this is a recommended 'ok deal'. There is a coupon available for an additional 8% off. The current deal is also the best price on this item over the last month. 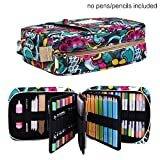 Compare the current price, savings (in dollars & percent) and Buy Ratings for the top Pencil Cases that are closely related to BTSKY Cute Pencil Case - Large Floral Pencil Pouch Makeup Bag. Here is how BTSKY Cute Pencil Case - Large Floral Pencil Pouch Makeup Bag compares with other leading Pencil Cases. 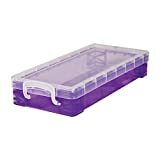 Best Solution to Store and Organize Your Pencils and Art Supplies! Smart and lightweight pencil case is the perfect solution for organizing all your pencils, pen, art supplies . Compact pencil bag with maximum storage space. The pencil holder has a flap to sort pencils and gel pens for easy glance. No more digging from a messy pencil box. Superior Quality Materials and Uncompromising Craftsmanship Attention to detail is reflected in the fabric and material selection, zippers, stitching and construction. No shortcuts! 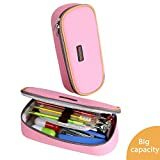 Perfect Design to Protect Your Stationery The pencil case hold each pencil or pen as well as other small items securely and protect them from falling out. It always keep you stay organized. 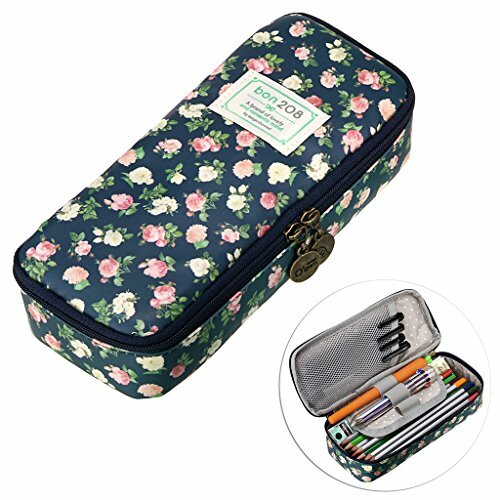 Specification: Material: Waterproof Polyester Color: Dark Blue and Light Blue Style: Floral, cute pencil case for girls Size: 7.55'' x 1.77'' x 3.15'' Package Included 1 x Empty Pencil Case FeaturesPencil Case with Compartments - You can store, organize and carry pencils, pens, markers and so much more. The interior zippered pocket is roomy enough for small items such as sharpeners, small notepads, erasers, cell phone, etc.Secure and Protect Your Precious Collection- The elastic strap holds pencil or pen securely and prevent them from falling out or being stepped on. The zipper in the back pouch ensures that nothing slips out during transit. The right tool to safeguard your expensive collection.Compact Size for Travel: Lightweight and compact, you can unzip the pencil case when you need to take pens, after you finish your work, simply zip it up and toss it in your book bag or carryon.Versatile: This can be used as pen/pencil bag as well as makeup pouch, coin purse. Perfect for hold pens, pencils,cosmetic and any other small accessories.It is made of waterproof material to protect things inside.